After my L’Oreal Colour Richer Palettes posting (here) I was asked – What is Eye Primer? I’m definitely not an expert but I do have some experience with eye primer. Have you ever put on your makeup and later in the day you notice shadow creases on your eyelids? Or how about smudged makeup? Makeup meltdown? Or what I like to reference as raccoon eyes? (You know, when the black liner and mascara smudge above and under your eye so I look like a raccoon? No offense to the raccoon of course!) One of the best ways to prevent this from happening is to apply a primer. The basic premise of eye primer is to keep it looking as fresh all day as the moment that you applied it and walked out the door. Well let me begin with the fact that primer exists for all different types of makeup application. There is eye shadow primer, mascara primer, foundation primer, and even lipstick primer. So lets just focus on the eye primer today. Eye primers are made to be used in close proximity to your eyes due to it’s sensitive nature. It is applied to the eyelid and lower eye area prior to the application of eye shadow or other eye makeup. The primer can come in a series of either tubes or tubs, some with small applicator brushes, and typically comes in a very neutral color that is adaptable to most skin tones. You only need a very small amount since the surface of your eye isn’t the same as covering the surface of your face. It starts off as a wet consistency similar to foundation (so don’t get freaked out) but dries fairly quickly. ** Tip: Make sure that you are applying a thin, even layer. Eye shadow primers help to not only intensify the color but also keeps the shadow from creasing and smudging. But don’t be fooled by the term eye shadow primer – it also works for eye shadow bases and eye liner. I have used it many times with just eye liner and it gives me a very smooth look and allows for the liner to pop. Simply add a touch of mascara and you are off to take on your day. I decided to cover a portion of my hand with primer and show you. 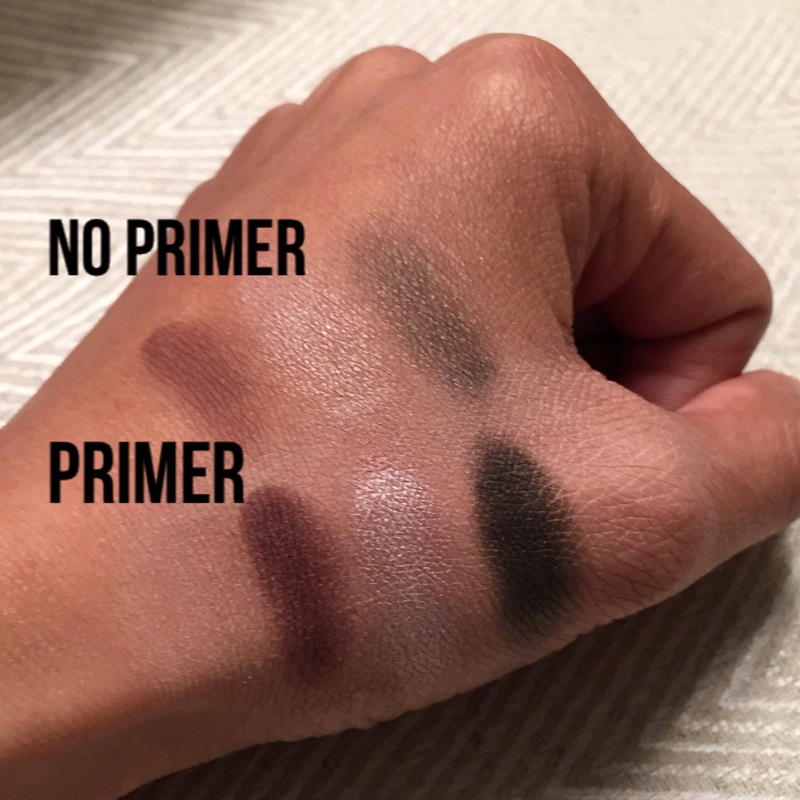 The picture below shows the difference in color intensity from the same eye shadows with the only change being that I used primer. I wanted to show them side by side you that you can quickly see the difference. 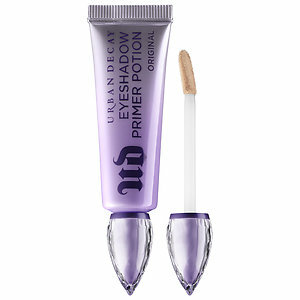 Personally, I use the Urban Decay Eyeshadow Primer Potion from Sephora. ($20) It is the best that I have found and it is really easy to work with. The tube may seen small but like I mentioned before – you won’t need much to get the job done. I have also attached a review of some other eye primers for your reading enjoyment here – the reviews offer good and concise feedback as well as choices and brands to cover all budget ranges. If you still can’t determine which one you like then maybe try sampling? Its a great way to start with new beauty products that you have never tried before. You can walk into a Sephora retail store and the staff there is always happy to provide you with a sample so that you can test it at home before making the full commitment. This is what I like to do when I am contemplating a few choices for myself. *Tip: I typically recommend about 2 weeks of use (of any sample product) before you decide whether or not the product is working the way you expected. If not, then try another option. Love the urban decay primer!!! Hard Candy has a really great primer too, when I run out of the urban decay the Hard Candy one is my go too. If your looking for a cheap great primer check it out. Love your posts! !